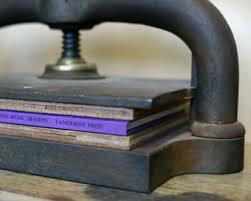 One-off chapbook journal of new writing. Contributors: Gerard Malanga, Heathcote Williams, Joan Jobe Smith, Clint Margrave, Edward Lucie-Smith, Steve Ely, Billy Childish, John Dorsey, K.V. Skene, Marc Olmsted, Paul Hawkins, Fred Voss, Charles Plymell, Ben Myers. General information: 32 pages. 6″/150mm wide x 300mm/12″ tall. Handsewn at the Sick Tangerine workshop. Recycled 325gsm Cairn Almond stiff card covers; front cover has ‘Quincunx’ signature hot foil stamped in blue ink; 100gsm Heritage Book White archival quality, Fourdrinier made, acid-free text paper; 130gsm Hahnemuhle Bugra Butten Light Brown endpapers. 50 numbered copies available for sale. Strictly limited to only 50 numbered copies for sale. 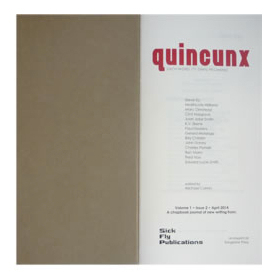 Quincunx is a one-off chapbook journal, never to be reprinted, repeated.